Weird and wild fungi are everywhere, especially when it’s wet out. Given the chance to explore and observe fungi, students will notice them everywhere. Exploring fungi will also lead students to appreciate how fungi function in ecosystems as decomposers and other important roles. Recent discoveries in science have found that huge underground networks of thin, branching tubes of mycelium, the white tubes that are the main growing part of a fungus, provide key links between plants and the rest of the ecosystem. 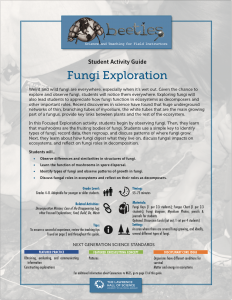 In this Focused Exploration activity, students begin by observing fungi. Then, they learn that mushrooms are the fruiting bodies of fungi. Students use a simple key to identify types of fungi, record data, then regroup, and discuss patterns of where fungi grow. Next, they learn about how fungi digest what they live on, discuss fungal impacts on ecosystems, and reflect on fungi roles in decomposition. Observe differences and similarities in structures of fungi. Learn the function of mushrooms in spore dispersal. Identify types of fungi and observe patterns of growth in fungi. Discuss fungal roles in ecosystems and reflect on their roles as decomposers.